If you spend months designing an app, creating a number of iterations, testing them, there’s no doubt you have a question: How to monetize an app? After all that hard work you’ll want to get a bit of brand recognition, to heighten consumer awareness or to gain the loyalties of new customers. An app is only as successful as the number of users who download and use the application and just how much money the app generates in terms of overall revenue. Sure, it happens once in a blue moon. Apps like Instagram, Vine, and WhatsApp come along and sell for huge sums of money. But, in the everyday world of app building and development, the average app won’t make billions. It’s just like the industry of publishing, there are thousands of authors, but only a few of them are bestsellers. You need to be confident in the success of your app, but there is a small possibility that your app will land you in riches. Statistics reveal that around 2% of the app developers claim more than half of the app revenues. You need to be realistic about your vision of success, so let’s see what you can do with app monetization. Can your app solve problems of the user, and if it is so, then how? What features make your app different from all the other apps on the market? Why will users pay for your product? What is its value? Research apps in the same category: What business model they are using to sell and market their apps? Once you've answered the questions above, you can move forward to create your own mobile app monetization model. Below are some of the major ways to monetize apps you can choose from. This business model is most attractive for users because they can download your app for free, without paying any penny and you are able to make money by selling data-driven advertising space. How do in-app ads work in free mobile apps? As a result, users see the small banners or popups with ads. Ads typically appear at the top or bottom of an app. If the user taps the ad, all sorts of possibilities open up from watching a video to the redirecting to advertiser’s website. Also, there is one more interesting type of ads – notification ads. Some people are calling them “Trojan horse ads” because they can send you the push notifications with the ad even when the app is dormant. Notification ads can be used while thinking how to monetize Android app. Because they are only supported on this platform. 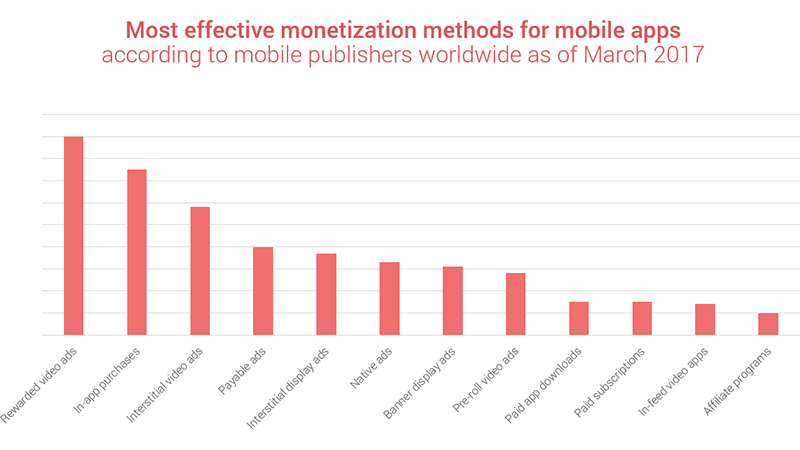 However, there are some shortcomings when monetizing free apps. For instance, some users find the advertisements annoying and decide not to use or even not to download the app with ads. Also, you need to take into account that advertisements may significantly limit the screen space of your app. You get the revenue in this strategy by selling virtual or physical goods or services within the app. It doesn't matter what you're selling. It can be clothing, gadgets, accessories or something virtual such as extra lives or in-game currency. One of the side benefits of in-app purchases is what you can get deeper levels of engagement by providing users with the opportunity to buy virtual goods. The only drawback in this model has some cons since app stores usually take a cut of the revenue for virtual goods purchased inside an app. For instance, for songs or a game. This model is a bit like free apps model. The app is available for free but some of its features are locked (gated). To unlock these features or get an access to premium features user should pay some money. In other words, users have access to an app’s basic functionality for free, but the premium features have their price. The Freemium model is most relevant for games. 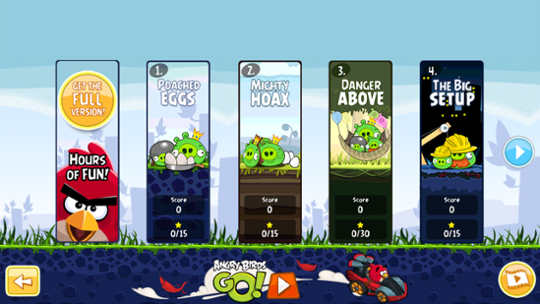 Angry Birds game is a great example of how a brand managed to get significant revenue using this strategy. Users were able to upgrade the game to the full version for a small fee. Such an approach allowed the company to get an extremely large number of fans of the game. After having conquered a few levels, users became engaged enough to pay for the full-fledged version for more hours of fun. You can assign a fixed price to every single app download. The price of mobile app development can vary depending on your app and its functionality. You will want to be fair about the pricing of your app, however. You have to persuade users to download the app by stirring a need or desire for the potential user. This means more marketing efforts. If you set a price for downloading your app, it means you use the paid app business model. The user has to purchase your app from the app store to install it on his device. The price of paid apps may vary and it usually starts from $0.99. It is the most common price as brands make money upfront with every new user. The success of paid app depends on your ability to showcase the value that users get with your app. It is not an easy task to sell an app because app stores are so overcrowded and users can find a free alternative to your app. Thus, your paid app should possess undeniable benefits that differentiate it from similar free apps. Provide your app with unique features, be it design or functionality or brand. This model is similar to the freemium model. Instead of the locked features, it makes money on narrowing conThe user. The user is allowed to view a limited amount of content for free. To get the more, the user needs to sign up for a paid subscription. This model allows you to earn revenue on a recurring basis as it most suited for content-focused apps (news, lifestyle, and entertainment). And it is very similar to “pay later” or “free trial” model. Apps with updating content can also earn money with ads that other brands place inside of them. Incentivized Advertising is a kind of sponsorship. It means you form a partnership with advertisers, who reward your users for completing certain in-app actions. Your app earns money by taking a share of the revenue from redeemed rewards. RunKeeper became one of the first apps that adopted this app business model. RunKeeper uses incentivized advertising to motivate its users to track their running activity to unlock exclusive rewards and promotions. As the competition between the apps becomes more complicated, you should use a creative approach while building your monetization strategy. You shouldn't limit your strategy to one model. You can work with blended models. For instance, start with a “free, but with ads” model and then offer users a paid upgrade to an ad-free version. The end lesson here is: be creative and courageous as much, as it possible and you will bound to succeed.